I’ve heard a lot of people raving about Scrivener, but I’ve always been a bit sceptical. I have developed a certain system for organising my writing projects which I like, and I had my doubts that any piece of software would be compatible with my existing system. When I edit, I like to be able to read through making notes on what I want to change rather than just changing as I go along. This way, I don’t find myself making snap decisions about changes to one part that then create more problems because they don’t take later parts into account. Not only did I find that Scrivener allowed for inline annotations (which may not be quite as visually easy to follow as Word’s commenting bubble system, but still do the job), I found I could even give my highlighter colours labels. It’s like they read my mind. Currently I have a separate document with notes on what my highlighter colours mean, so being able to have this information to hand as I was highlighting is excellent. I like to keep archive copies of my drafts so I can always go back and see my previous versions. Never throw anything away, that’s me. Currently I keep track of my drafts by numbering them, 0.1, 0.2 etc for incomplete first drafts, then 1.0, 1.1, 2.0, 2.1 etc. upgrading the first digit each time I do a substantial re-write and the second for more minor edits. It took me a little longer to find the Snapshot feature than the annotation features, but once I did I was very happy. Snaphots enable you to save/archive versions of your document that you can later revert to or just review to see what was there previously. Not only can I keep my old drafts, but they are attached to the current version of the document rather than being separate files cluttering up my computer. So far, my favourite feature has been the way I can navigate quickly between the different documents. I have all the benefits of breaking the project down into chunks with none of the inconvenience of having to juggle multiple Word files all the time. Earlier in the summer I took part in Camp NaNoWriMo (I only made it to 30k, but that’s another story) and I started writing my story in chapters, with a word document for each chapter. Every time I wanted to update my word count, I had to open all of the documents and copy each section separately into the text box on the website. Had I been using Scrivener, I could have just opened them all sequentially in the editor and highlighted the entire text to copy. I’ve now imported a project, which I had started but not progressed very far with, and started using Scrivener to work on it. I took the outline I had as a word document and turned each bullet point into an index card. Now, when I come to work on that point, I already have a document ready and waiting. I’ve broken the project down into much smaller units, just because I can. Scrivener has quite obviously been developed by people who write. There are lots of simple but elegant little features, like “Typewriter Scrolling,” which means the text insertion point remains in the middle of the screen, and the ability to increase the display size of the text while still having it wrap within the window you are using. So, my fears that Scrivener would be incompatible with my existing system were unfounded. Not only is it compatible, but it enables me to use my own system in new and more efficient ways (for example, I now have pictures for my characters sitting on the screen alongside the editor for inspiration). Within a few hours of using it I knew I was going to find it hard to go back to my normal way of working, but unfortunately, the Windows version is still only a beta and I don’t want to entrust it with any of my longer, more complete works. However, at only $40 on release I have already decided I will be buying a copy when it is finally ready. My verdict: a big, starry-eyed thumbs up. I’d love to hear your experiences with Scrivener, good or bad. What would your deal breakers be when considering a new piece of writing software? I’d also be interested to hear if you use an alternative program and how you get on with it. 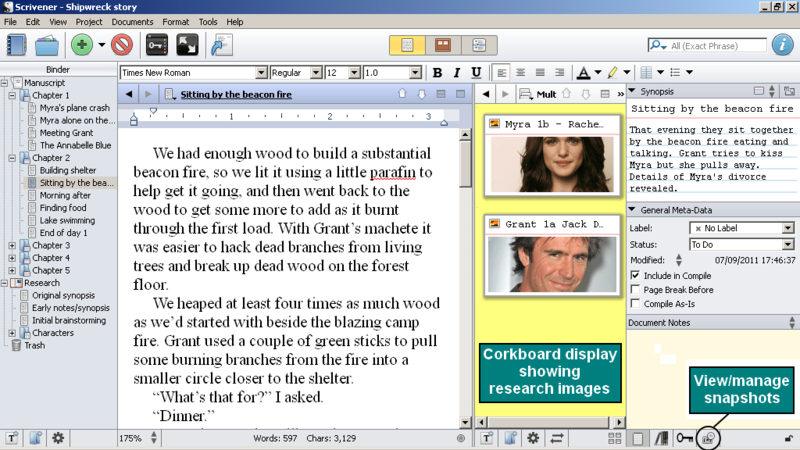 I, too, tired out Scrivener for Windows but it was an earlier beta that I downloaded. The features all looked great but I couldn’t use it because at the moment the Windows beta has a compatibility issue with tablets – my mouse is used with my graphics tablet, so I couldn’t navigate or click on anything. It’s interesting to know about the tablet issue. I use a laptop with a touchpad mouse, or else a USB mouse, so it’s not something that came up for me, but I can imagine it could inconvenience a lot of people. Oh wow, what a cool piece of software. I may well have to look into it for a bigger project, that way I can break it down into easy to manage chapters as well as being able to set achievable goals for the characters, thanks for this Chrissey. Thanks for the test drive info, Chrissey. I’ll keep this in mind the next time I go software shopping. I’ve been keeping an eye on Scrivener for quite some time. Thus far, I’ve been using Liquid Story Binder while I wait for Scrivener to work out the initial kinks in its Windows version. I’ve not seen Liquid Story Binder before, I’ll have to look that up. Thanks for the info. I’ll pop by your blog too when I get the chance. I had the same concerns, but so far I’ve found the benefits have outweighed the inconvenience of adapting. But then maybe I’m more predictable than you! I can’t recommend Scrivener too highly – but I use the Mac version and have done for a long time. When the Windows version catches up with our v2 then it will be brilliant for you. Until then, you have to use what it does offer and be content. But it will be worth waiting for! I use it for all my writing, although inevitably things have to be sent out in Word eventually. But Scrivener’s makers know that, and make it easy to export when you’re ready – and also to e-reader format too, which is a godsend for those who want it.